There were three bookstores downtown in the past 30+ years, one mainstream, one quality paperback store, and one high-class used and rare bookstore run by Nancy Filler. 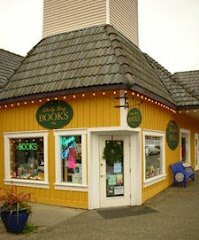 For used books, I closed Interim Books in 2001, but there was another on 4th and one over in Manette that held on for a few more years. A 1985 yellow pages lists a B. Dalton at 213 Pacific, where the park is now. It also lists Harbour Books at 322 Pacific and Interim Books on 4th. Hooray! As a book lover and soon-to-be resident, I’m looking forward to stopping by and doing my part to support Liberty Bay so it can justify making its addition permanent! Can’t believe I forgot about Harbour. Harbor closed… In the early/mid 90’s if I remember correctly. There was a skateboard shop there for a couple of years, and then Nancy and I moved Interim from 4th to Harbour’s old location around ’98 or so. There was also a new bookstore about where Starbuck’s is today. Closed in the mid/late 90’s when they tore down the building to make way for Sinclair Landing and the new ferry terminal. Can’t remember the name, but Tom (one of the employees) worked for me at Interim for a couple of years. I’m getting old or something, should have remembered all this. Good for her!! I hope it works! !